There is also a library and a conservatory of 20 m2. Additionally you will have shared use of the dining room and terrace and the living room, the pool and pool terrace, the Sauna area and the garden area with the Eira and seats near the fountain and the pond. Breakfast is from 8-9 am – lunch at around 1 pm – supper available before or after the evening meditation. Meal times and menus can be scheduled in coordination with the group. Vegan-vegetarian food only. We are a non-profit association promoting healthy lifestyles, including growing organic fruit and vegetables and preparing vegetarian and vegan health food. In order to keep our cost low we have no paid managers or hired help. We all work on voluntary basis, sharing the daily activities like cooking, housekeeping and maintenance. Workshop participants pay a donation to the association to cover the cost of accommodation and meals (or the facilitator pays for them). Presently we ask a donation of € 120 per person per week (7 days, 6 nights) or € 20 per day from every participant, including facilitators and helpers. 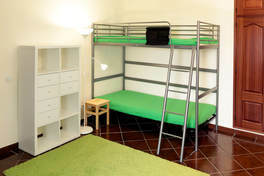 This includes shared accommodation, dormitory style, including linen and blankets. Also included are three meals per day, plus coffee, tea, purified drinking water and fruit. Wifi is available in the dining area and other public spaces, but not in dormitories or the group room. Not included are specific materials (if needed) for the workshop. Washing machine and dryer area are included as well as the swimming pool - available every day - and the Sauna - heated up several times per week in winter. If group members are unable to share in cooking and housekeeping their donation may need to be increased and the extra money used to offer discounts to helpers among the participants or pay the cost of accommodation for other volunteer workers. For the use of the group room we ask € 2 per participant per day. The private session room can be used for € 2 per hour. We normally charge a (beneficiary) member registration fee, but this is not charged in case of workshops and groups. All donations are payable in advance. Special arrangements may apply for members who are staying long term, and/or are invited to become part of the core team of coordinators. We have a daily schedule of morning exercises at 7 am and evening meditations at 7 pm, available for all members and volunteers. These activities can be combined with the workshop or kept separately. There is no extra charge for participation. Private double rooms are available at an extra donation. These are situated in other areas of the property. Book early if you want to be sure of availability. Weeks typically start on Sunday afternoon and end the next Saturday night (Sunday morning possible on request). Other arrangements are possible. Facilitators can calculate the fee for their workshop, based on the donations per person that Laozi House requires, adding their cost for tuition, helpers, materials, external services and transportation. Participants will reserve directly with them, not through Laozi House. However for their accommodation they have to sign our membership conditions, unless they are participating under a written contract with the facilitator that excludes Laozi House of liability and the facilitator rents the accommodation from Laozi House.